Join us next Friday, June 20, for the 2014 McCall Gala. Come to connect and commit to Oregon's future. Meet Emerging Advocates and hear from three standout Oregon innovators. It's not too late to reserve your seat! Summer Is Coming. Explore With Us. Land use is your community, your home, your street. It's where your food comes from and how you get where you're going. It's a place of possibility, if you know what to look for. This summer, we'd like to take you out to see land use in action, with our new line-up of field trips! From bottles and beaches, to protecting farmland and forests, Oregon's environmental legacy speaks volumes. On April 17 in Salem, Mike McCloskey, a former executive director of the Sierra Club, spoke about his new book on that legacy as part of our McCall Society Speaker Series. Few people know conservation history as well as Mike McCloskey. This is true in part because he just wrote a book on the topic, but more to the point—because he has lived it. Wim Wiewel: Time for "Bigger Plans"
Wim Wiewel keeps a bust of Daniel Burnham in his office. 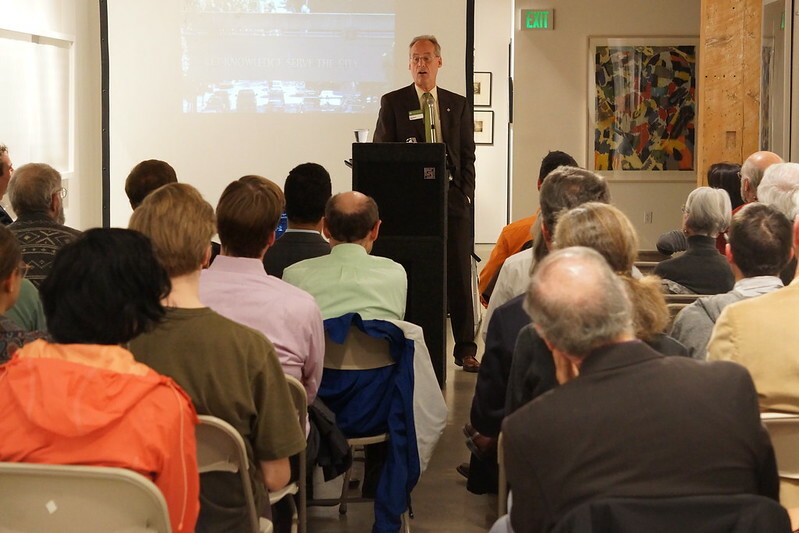 He didn’t bring it to our McCall Society Speaker Series event on October 16, but the Portland State University President did describe it in absentia to make a key observation about Portland and Oregon. 1000 Friends is excited to welcome Portland State University President Wim Wiewel to our 2013 McCall Society Speaker Series. We asked him to share his Oregon Story.